Unsaturated Polyester Resins Market size was more than USD 7 billion in 2014, and is anticipated to grow at over 7% CAGR over the projected timeframe. The global unsaturated polyester resins market size is primarily driven by growing composite demand due to its lighter weight, low cost and superior durability. The product is widely used in the industry to enhance its composites mechanical, flexural, thermal and morphological properties. In addition, the overall composites industry was valued at over USD 25 billion in 2014 and is projected to exceed USD 40 billion over the estimated period. These product based composites are extensively used as a metal substitute across various end-use industries including construction and automotive, and will positively influence the global business growth by 2022. In 2014, the overall construction investment was close USD 7 trillion and is forecast to surpass USD 13 trillion over the estimated timeframe. The product finds widespread application in the construction industry across tanks, pipes and water management systems. 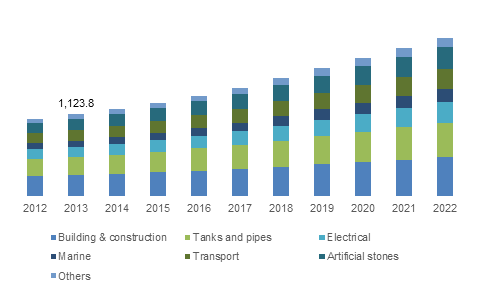 Furthermore, increasing corrosion resistance and highly flexible product demand in the industry across the globe is analyzed to boost the global unsaturated polyester resins market size by 2022. In addition, the product is also used in building panels, concrete rebar, concrete forming pans, doors, electrical boxes, floor grafting, shower stalls and hot tubs. Thus, such widespread product applications across construction industry will boost the UPR market size over the projected timeframe. The product is used in manufacturing powerboats, sailboats, kayaks and personal watercraft and canoes. Growing recreational industry on account of enhancing lifestyle dynamics will boost the UPR market share by 2022. In addition, the product is broadly used in the automobile part manufacturing such as body panels and structural elements owing to its light weight property. It helps in reducing the overall vehicular weight and subsequently enhances the engine performance. In 2014, the automotive production, including both personal & commercial vehicles, was roughly around 87 million units. This trend along with increasing government initiatives to minimize automotive emissions will increase UPR market share in vehicles. Orthopthalic UPR market was the largest product segment in 2014. The product is extensively used in the fiber reinforced plastics (FRP) business due to their superior corrosion resistance along with low cost. FRP are substantially used in the construction, marine, aerospace and automotive industries, this will subsequently boost the overall industry growth by 2022. FRP also reinforces the overall mechanical strength of the material and reduces the possibilities of deformation or creep. The product is also used in the oil & gas industry for basic equipment such as tank and pipes. Dicyclopentadiene (DCPD) product segment is forecast to observe highest gains at about 8% CAGR over the forecast timeframe. The product is preferred in manufacturing parts for recreational boats and tanks owing to its superior characteristics. It is also used in paints, adhesives and inks owing to its aromatic traits. However, the product has associated regulations regarding its handling, exposure and usage, which may hamper business growth by 2022. The global unsaturated polyester resins market size for construction and building was valued at over USD 1.5 billion in 2014. The product finds widespread applications in the construction industry for roofing, reinforcement and household structures composites. Increasing government construction spending to enhance their public infrastructure will boost business growth over the projected timeframe. The global unsaturated polyester resins market size for marine applications is analyzed to witness maximum gains more than 8% CAGR over the estimated period. Increasing international trade via sea/oceanic route along with improving lifestyle dynamics have increased the number of trade ships and recreational boats respectively. Superior product traits such as water resistant coating along with superior mechanical strength makes it desirable in marine industry. This trend shall boost the global industry growth by 2022. Asia Pacific, led by China and India, was the largest region for the unsaturated polyester resins market size in 2014. Robust growth in the construction and automotive industry in China, India, Thailand and Indonesia has propelled the regional industry growth. The global unsaturated polyester resins market share was moderately fragmented in 2015 with major industry players comprising over 30% of the total share. Key industry participants include Changzhou New Solar Co. Ltd., Tianhe, Ashland, AOC Resins, BASF, Dow, CCP Composites and SABIC. These industry players are engaged in R&D investment towards bio-based product development. Furthermore, some of the industry players are involved in expanding their global presence by increasing their production capacity by opening a new manufacturing facility and strategic mergers & acquisitions. Styrene monomer is an essential raw material used in the product manufacturing process. The raw material has associated health concerns, particularly in case of direct eye & skin contact, inhalation and ingestion. Thus, the industry is sternly directed and regulated by government regulations. This is likely to hamper business growth by 2022. However, increasing R&D investment from the industry participants towards the bio-based UPR market will create new growth prospects over the estimated period. Global UPR market size is primarily driven by robust growth in the end-use industries including electronics, construction and automotive. Growth in these end-use industries significantly increases the product demand across the globe owing to its value-added characteristics such as high water resistance and strength which prevents deformation or creep. However, strict regulations laid by EPA, DOE and ANSI regarding product storage and exposure is one the biggest challenge faced by the industry participants. In 2014, Asia Pacific was the largest industry share contributor owing to escalating construction and automotive sector in the region.